↑ Lewis, Rebecca, PhD (5 April 2009). "1939: The Three Posters (PhD Extract)". 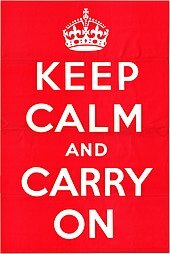 Keep Calm and Carry on and other Second World War Posters: British Home Front Propaganda Posters of the Second World War. Clampin, David (2009). ""To Guide, Help and Hearten Millions": the place of commercial advertising in wartime Britain, 1939–1945". Journal of Macromarketing. 29 (1): 58–73. doi:10.1177/0276146708328054. Inkster, Nigel; Nicoll, Alexander (2010). "Keep Calm and Carry On". Survival: Global Politics and Strategy. 52: 249–256. doi:10.1080/00396331003764777. Lewis, Bex (2012). "The Renaissance of 'Keep Calm and Carry On'". The Poster. 2: 7–23. doi:10.1386/post.2.1.7_1. Walker, Susannah (2012). Home Front Posters of the Second World War. Oxford: Shire. ISBN 9780747811428. หน้านี้แก้ไขล่าสุดเมื่อวันที่ 25 ตุลาคม 2560 เวลา 22:08 น.